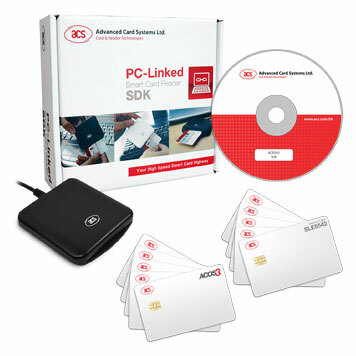 The ACR39 development kit from ACS, based on the ACR39 series of USB smartcard readers, is a hugely popular kit offering a range of useful products bundled together with development tools, libraries and training materials. This kit provides both beginners and experienced developers with various valuable learning materials to accompany the hardware, and is great value for money. The kit includes drivers, source code samples, training materials, tools and demonstration software applications on CD. Drivers and demo programs for Windows showcase the ACR38 features and capabilities as well as the included ACOS3 and SLE5542 smartcards. Further supplies of cards and readers are available from our store, as well as several reader models in alternative form factors. The ACR39 series readers are fully PC/SC and EMV Level 1 compliant and support all ISO 7816 microprocessor-based smartcards as well as numerous popular memory cards. All ACR39 readers contain the same card interface chip with the same specifications housed in different casings. They are single chip solutions that have been certified by EMV Level 1, FCC, CE and Microsoft WHQL. ISO 7816, EMV & PC/SC compliant. The ACR39 replaces the previous ACR38 range, with improved performance.